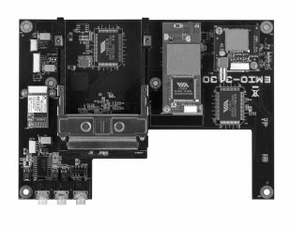 The VIA EMIO-3450 is designed for easy integration with Em-ITX boards including the VIA EITX-3000. Designed for in-vehicle and fleet management and logistics applications, the VIA EMIO-3450 brings a flexible array of communications options including Bluetooth, Wi-Fi, GPRS and a variety of 3G and 3.5G options. Supporting two Mini-PCIe slots, the VIA EMIO-3450 can integrate a range of 3G modules including HSPA, WCDMA, EDGE and GPRS. A SIM card slot is also included. An optional 20 channel GPS receiver and a 802.11 b/g Wi-Fi module are also included, as well as support for up to three antennas. The VIA EMIO-3450 also supports up to four additional USB ports and provides both UART and GPIO ports and 6 watt audio amplification via three audio jacks.